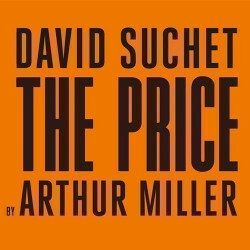 The Price is a classic 1968 play by Arthur Miller. It explores family dynamics, the price of furniture and the ultimate cost of the decisions we make. The play premiered on Broadway in 1968, when it was nominated for two Tony awards, and has enjoyed four Broadway revivals since then. Now it's back in the West End to delight everyone who loves top class theatre. Take one generous dose of Matthew Broderick, the American actor and singer famed for his roles as the title character in Ferris Bueller's Day Off, the voice of the grown-up Simba in Disney's Lion King and a great many more. Grab one extraordinary play crafted with love and care by Kenneth Lonergan. What do you get? 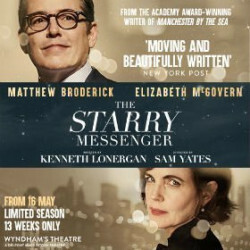 It's the remarkable The Starry Messenger, a magical play that might just change your life. What happens when one very clever chap invents a marvellous new fabric that never, ever gets dirty? Havoc, that's what! 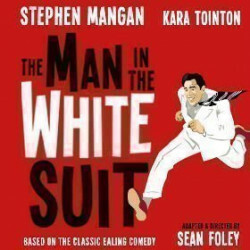 Welcome to the stage version of the brilliant Ealing comedy of the same name, brought bang up to date thanks to the talented Stephen Mangan. The result is quirky, charming and very funny, set like the original in the 1950s. From the outside an impressive, majestic creation in pale stone with ornate archways, round windows and pillars reminiscent of ancient Greece, inside Wyndham’s Theatre is a delight with its pale blue, cream and pastel green décor, encrusted boxes and absolutely stunning painted ceiling. Not to be confused with the author John Wyndham, Charles Wyndham was a famous name in theatrical circles during the late 1800s, so much so that he was eventually knighted by King Edward VII. The great man has always dreamed of his own theatre and his good friends funded the theatre that bears his name, raising enough cash to build the venue on a site owned by a member of the nobility and a great admirer of his work. Designed by the prolific architect W.G.R. Sprague in around 1898, who designed six other London theatres during his lifetime, the first play was a popular revival of T.W.Robertson's play, David Garrick. J M Barrie, who wrote Peter Pan fame, had plays put on there, as did household name stars of the day the du Maurier family, of Daphne du Maurier fame, and Edgar Wallace. But the Wyndham’s Theatre’s biggest smash was the infamous French Riviera musical The Boy Friend, which showed there for the first time and broke records in the process. Running for an impressive five years, it finally transferred to Broadway and shot the singer-actress Julie Andrews to sudden fame. In 1910 Gerald du Maurier began a partnership with the theatre that lasted 15 years, and was involved in setting up the stage debut of the infamous silver screen actress Tallulah Bankhead. Daphne du Maurier apparently used to watch her father on the stage, from the wings, and she eventually produced a play of her own, called The Years Between, on the same well-loved stage. Over the years the theatre has traditionally alternated dramatic and comedies, with the odd feel-good factor musical show in between. 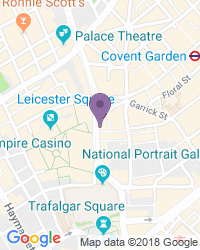 Stars like Vanessa Redgrave, Maggie Smith, Judi Dench, Kenneth Branagh and Madonna have graced its stage, and its central location means it’s an enduringly popular venue with the people who create and publicise shows. The venue was Grade 2 listed by English Heritage in 1960. Today it is controlled by Delfont Mackintosh Theatres Ltd.
David Essex and Jeremy Irons made their West End debuts at Wyndham’s Theatre in 1972, playing in the musical Godspell. Art, the multi-award winning play, kicked off there and went on to run for a cool 2,000 performances. Madonna made her West End debut here in 2002 in the play Up for Grabs. Chekhov and Shakespeare plays and big hitting shows like The History Boys and the C S Lewis life story Shadowlands have also appeared at Wyndham’s. There’s an infra-red system with headsets and guide dogs are welcome in the auditorium, although staff can dog-sit if you prefer. There are two disabled spaces in Box A but no access for electric wheelchairs or scooters. We’re a trusted destination for a wide variety of seat types and prices, with excellent availability on the full range of Wyndham’s Theatre tickets.